Every time I walk past the sculpture made from flotsam and jetsam on Callala Beach, I stop to see if any newly found objects have been added. I know he puts a smile on so many faces, including my own. I see tourists stopping and snapping a holiday photograph as they loop an arm over his woody shoulders. I think of the objects that have become his substance. A fisherman’s cap blown off by a sudden gust of wind and lost in Jervis Bay. Sunglasses that have been casually left behind on a beach. A body surfer’s flipper ripped from his foot as he was pounded by a wave, gasping for air. A diver’s wetsuit gives his body the most sculpted impression. His long tendrils of sea weed hair remind me of Bob Marley’s dreadlocks. Beside him are tennis balls in case he gets bored and a rusted gas bottle if he wants to have a barbeque. In addition, there are extra t-shirts, hats, goggles, thongs and even a car tyre that he can use as a personal flotation device. I often wonder who started this community sculpture. But what I speculate about most is this: Is the sculptor sending us a deliberate message? Of course, we can see the humour in the comical form of Mr Flotsam Marley. However, it also makes me feel melancholic. So much marine debris just on this 5 kilometre stretch of beach that tourists flock to each year because of its whitest sand and most lucent water. Yet, these fragments that have been carelessly cast or lost are contributing to the demise of many species of marine life. They could also be making their way to the Great Pacific Garbage Patch. Currents and great gyres carry human litter to the North Pacific Ocean combining with collections in the Eastern Garbage Patch near Japan and the Western Garbage Patch near Hawaii. Like a great vortex (it is also known as the North Pacific Trash Vortex), it accumulates non biodegradable materials, mostly plastic. As these pieces never decompose but instead break up into even smaller pieces, humans are producing a murky soup that has become so very appetising to marine life, such as the Loggerhead Turtle and various Albatross species. 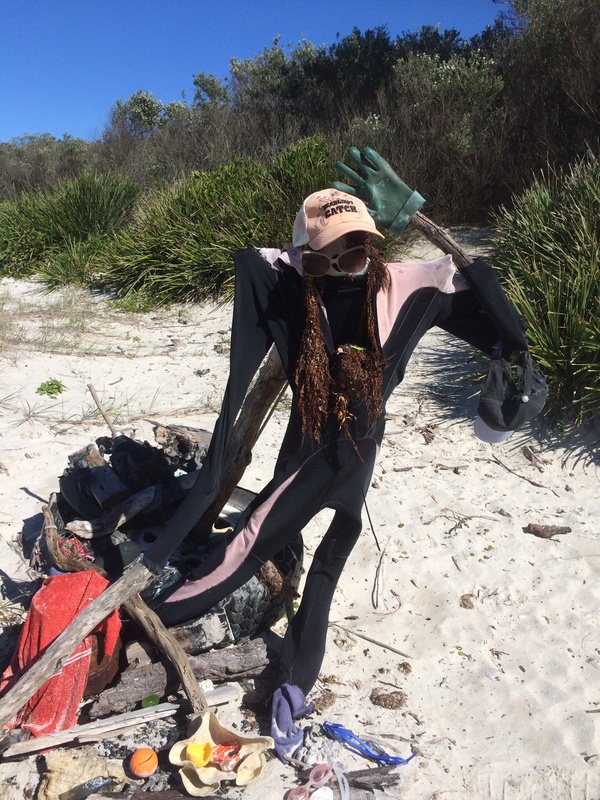 It is estimated that what we are seeing on our beaches comprises only 15% of marine debris. 70% of it ends up on the ocean floors and the remaining 15% is what is found floating in our oceans. The old adage,’ Just because we can’t see it doesn’t mean it isn’t there,’ holds very true. So I would like to thank the Callala Beach sculptor for inspiring me to ponder about Mr Flotsam Marley and his unique looks. Art can provoke thought and sometimes make people take action. That debris has been personified and stands there on my beach as a reminder. I say thank you for motivating me to think more about the reckless rubble of human consumption. Thank you for encouraging me to delve into the subject of marine debris. It may only be one person who changes but I now carry a bag while out walking and make my contribution to easing the flow of waste and making that sordid garbage patch that tiny bit smaller.